At least, that’s what the Exiles web page had told me, and I was about to put it to the test as I stepped off the plane in Bogotá, Colombia at 04:30 local time. Does it sound like I was prepared? Probably not. But details had been kept intentionally vague to resemble a live event as much as possible. Sure, we’d had the occasional chat on our WhatsApp group about whether we would be able to find fuel in Colombia for our stoves (turns out the answer was a no), but essentially all we knew was that we were going to be learning all about how to survive in the jungle, whilst also covering common medical issues that we could face there. All in all, I couldn’t wait to get started! After a day of travel, introductions and lounging by the pool with beers in hand, we all had to be up bright and early, ready to leave by 6am on Monday. The main highlight of the night was that my hammock held my weight without too much creaking- though we were all surprised by how low temperatures reached at night! Our instructions were clear, and by 06:00, 20 bleary- eyed Exiles piled onto a minibus with all we needed for Jungle School. Everything we took with us had to be waterproofed and light enough for us to carry on our backs. I understood the need to be able to carry all of our kit, but were we really going to need to be fully waterproof…? After an hour of gazing out of the window at the landscape, we arrived at our drop- off point, sadly waved goodbye to air conditioning for the foreseeable future, and started our walk to our basecamp in the Sierra Nevada rainforest with one of our survival instructors, Chris. Chris was a great guy- small, wiry and with an accent that can only be described as South African, (however much he told us he was from New Zealand). He was full of useful nuggets of information- pointing out termite nests, banana trees and making the walk through the jungle all the more interesting thanks to his knowledge of the area. Now, I’ve seen my share of nature shows thanks to my family’s love of Sir David Attenborough, but nothing can prepare you for the assault on the senses that the jungle hits you with. The noises of various unknown animals, the sound of flowing water just out of sight and unknown smells surrounding you all boggle the mind. Even then, all of this paled in comparison to the sight of the jungle canopy as it starts stretching out beneath you, putting a Dulux colour chart to shame as endless shades of green blended together to form the backdrop to our many photos, which attempted to capture even a taste of what we were experiencing. Finally, after our ‘short’ walk of approximately 3 hours, we crossed our final river to be greeted by the rest of the DC Bushcraft team, at what was to be our camp for the rest of the course. Hugging the river’s edge, our basecamp consisted of a clearing facing onto the river, where the DC guys had set themselves up, with logs conveniently placed to provide seats around the fire. The clearing ended in a trail which wound its way 20 metres through the trees, old leaves thick on the ground, until it ended in another clearing, just a few metres away from the river across a rocky beach. The second clearing we adopted as our own for congregating, teaching and eating. Having set up, the rest of the day was spent in lessons, first with Chris and our chief instructor Duncan, learning how to start a fire from various materials, and how to keep the fire burning once we’d achieved a flame. It was immensely satisfying seeing a flame catch and grow from our efforts. 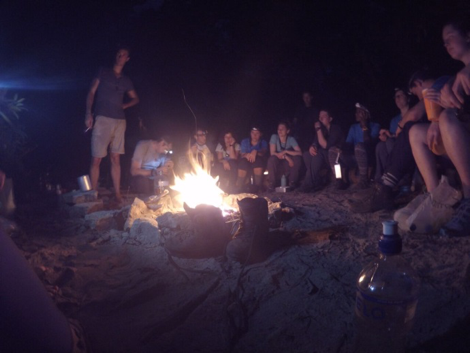 Duncan was keen to tell us all of the different ways we could set up a fire and its varied uses in the jungle, from sterilising water and equipment to creating fire hardened spears. What he didn’t realise was that for many, the promise of a cup of boiling water for their coffee in the morning was their most important motivation at that moment in time! Following on from our survival lessons, we settled into our Exile camp- trying to find a comfortable rock to perch on that didn’t quite put our spine out of alignment- and listened to Brett’s introduction of Exile Medics and jungle medicine. There’s nothing quite like learning about something when you’re thoroughly immersed in it, and we could most definitely relate to the tales of heat, dehydration, bites and falls after a long day’s work! 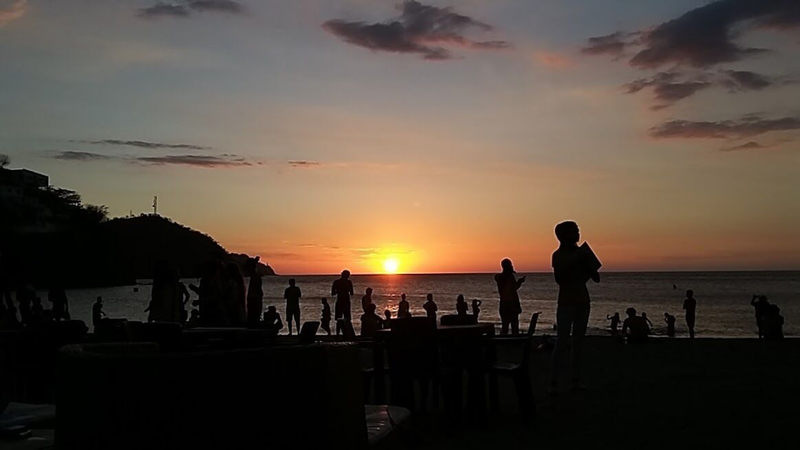 And yet for all that, as I swayed in my hammock that night with the white noise of the jungle around me, I began to fully appreciate just how much of a privilege it was to be with such an amazing group in such an extraordinary place. Well, it certainly beat Nottingham anyway! Tuesday started early with coffee brewed, breakfast boiled and copious layers of sun cream and DEET plastered onto exposed skin. We were already beginning to compare bites from the previous two days, and I was suddenly becoming very conscientious about taking my malarone! Lessons were soon starting after breakfast, so we skipped from rock to rock along the trail to get to the Exile camp. It’s not that we were in a particularly good mood; it was more to do with us having recently discovered that- because leaves provide such good insulation- spiders, scorpions and other creepy crawlies choose to live in the dead leaves that scattered the trail. It felt appropriate that our first lesson was going to be on animal bites! After a successful morning grimacing at photos of animal bites and their effects, followed by some splinting and compression bandaging of fellow Exiles’ ‘snake bites’ we were ready for our next survival session. Boris- one of the survival instructors- led us down to the beach chatting away, curious about what we’d been learning as he strode ahead in his ever present combat fatigues. He was a really friendly guy, and the quality of his English (his second language) was making me realise just how poor my Spanish really was in comparison! At least, that’s what we’d been taught as one of our first lessons on Monday, but that didn’t stop fire and water from coming a close second and third. Duncan seemed to agree, as today was all about how to find water, filter it and make sure it was safe for drinking. We learned that water is everywhere in the jungle (well, maybe ‘learned’ is a strong word considering we’d been wading through enough water sources on our way in!). In fact, locating it is rarely the problem, it was more a case of what water could you trust. Which vines gave you safe water? How could you make a filter out of natural substances? Could stagnant swamp water be made safe? How much water could these different techniques yield? We spent the afternoon answering all these questions and more in the best way possible- testing it out for ourselves. Ray Mears eat your heart out. Now there’s one element that ran through the entire week which I’ve failed to mention until now. Every Exile is afflicted with it to varying degrees, and I think my friends would agree that I have it by the bucketful. The diagnosis- an immensely competitive nature. Every lesson in the jungle was turned into a competition, and Brett stoked the fire all the more by appointing Deb- the resident Exile Fellow- to divide us into houses and award us house points based on our performances throughout the day. Our team names were outrageous, and the things we did in the pursuit of points even more so! The scores would never be far from our minds, with 4 ropes hung up in camp with karabiners looped through them to show the respective teams scores. This competition was nothing though, in comparison to the war Brett was waging against his nemesis. We first became aware of Brett’s enemy in our briefing by the pool on Sunday, when he told us of the one animal we had to be careful of at all costs in the jungle. Most animals avoid humans at all costs, and only attack if threatened. Not this one, Brett assured us, as he looked us all in the eye as he spoke with the upmost gravity of the most dangerous animal we could come across in the jungle- a wild pig. Brett’s phobia ran deep, and proved to be a gold mine of material to tease him with. But on Tuesday evening, Brett faced his demons. It was made (much) easier for him by the fact that his ‘fearful foe’ was dead, cooked by our instructors and smelt delicious, because we were to be treated to a hog roast on Tuesday night. It got better when we heard that not only would we be having a great evening meal (much better than the camp food pouches that we were already getting bored of!) but we were also to be sharing the meal with the chief of the Kogi tribe- one of the four main tribes that inhabited the Sierra Nevada- and his family! What a way to finish the day, being served pork with rice and vegetables, using a banana leaf as a plate with the night closed in around us as we huddled close together on the logs. The fire crackled to our front; with the now familiar sounds of the jungle to our backs as we listened to Boris translate our questions for Sylvester (the Kogi tribe’s chief). Sylvester happily told us of the Kogi tribe as he sat next to his wife, who was patiently making a woollen bag that resembled a climber’s chalk bag. All of the family were dressed in white, which we learned was the colour symbolic of the Sierra Nevada. Sat under the jungle canopy, learning about the culture, beliefs and lifestyle of the Kogi from Sylvester was an honour. Words fail to describe just what an amazing night that was. All that can be said is that it truly was a ‘once in a lifetime’ moment. Wednesday started with routines that were already becoming well- established. The jungle really was beginning to feel like home and after some breakfast, a swim in the river and a chat by the fire we were ready to start the day with our lesson on heat illness and its effects. Deb’s lesson on heat and its effects was really interesting and made me realise the scope to heat illness which I’d never appreciated before. Add to this the constraints that a wilderness setting put on your level of care, and heat illness was bumped right up the list of things that I felt I that should know about as an Exile! To round off the session, we were split into our teams, each with a hot water bottle to see who could find the most innovative way to cool it down the most. Two teams weren’t allowed to use the river. I’d have felt bad for them, but we needed the house points more than they did! After lunch (which featured amazing pork crackling) our survival training was to continue with the next most important aspect of survival: shelter. We’d been taking shelter for granted the last few days what with our tarps and hammocks, but now we were going to learn just what could be done with simply a tarp or the materials the jungle provided. So what can a 3m x 3m tarp do? Well with Chris in charge of it pretty much anything apparently. Chris had us setting up A- frames, lean to’s, even a tent could be set up out of a tarp! I’d already used tarps outdoors occasionally, but this sessions proved just how versatile they are in an outdoor setting, with each set up being able to fit the whole team comfortably. Finally, the main event: how to set up a shelter using nothing but materials from the jungle around us and some paracord. After standing around for a minute or two scratching our heads, we decided on one big A- frame design using bamboo as the main frame, a conveniently placed tree as one side’s standing support and paracord to lash it all together. This is when the miracle happened. Something none of us thought that we’d ever see… Duncan got excited. Duncan was a nice guy and a knowledgeable instructor but until now he was the kind of guy who always kept an even keel. That was until we started our ‘Grand Design’, and suddenly he was everywhere at once, incredibly keen to see what our efforts could produce as we threw together our shelter. The end result? An absolute masterpiece! Looking back, this was a defining moment as we saw what our efforts had produced. We’d come into the jungle with a mixture of skills and experience, but after this we could all say that we knew the essentials of survival in a jungle environment, from fire making and water sterilisation to camp craft and shelter building. ‘Oh for f*** sake!’ I muttered as I stumbled on what must have been the 15th rock in as many minutes. I looked around to check I hadn’t caused anyone else to slip. My eyes falling to rest on the 70L North Face bag resting on our makeshift raft that we were now carrying through some more rapids. I was seriously considering just how much trouble I’d be in if I pitched the bag off the side of the raft and claimed heat illness as my excuse. I should explain. The day started off as normal, with the added bustling around of Exiles striking camp and clearing the area of any trace of our presence. Everything was bunged back into waterproof dry bags and we met by the river to discuss the day ahead, which we assumed to be a simple walk out, followed by a surprise we knew Brett had in store for us. We were wrong- it wasn’t going to be a simple walk. The trek out was going to be another lesson, this time in evacuating a casualty. With the North Face bag as our patient, we needed to make a raft to float down the river. The raft needed to support the weight of the ‘casualty’ whilst not being too heavy to lift between six of us, when we needed to clear the rapids and rocks which littered the route we were to take through the river. 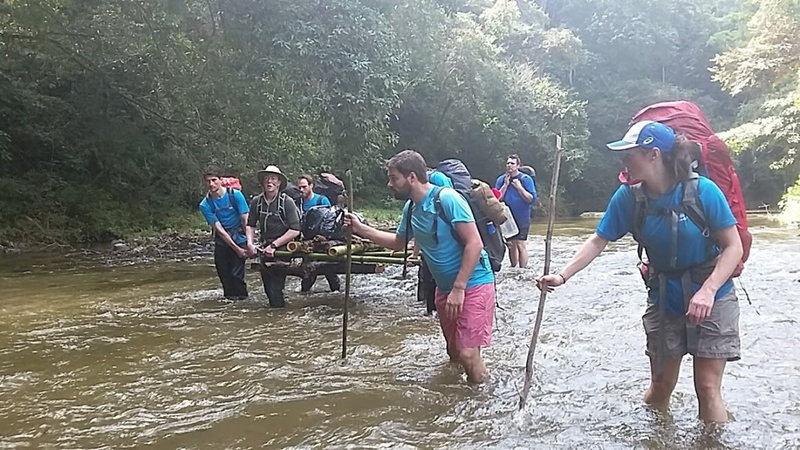 Wading through the river, carrying a heavy load, trying to move in time with your other five team members whilst trying to avoid grounding the raft or slipping on treacherous rocks was not only physically tiring but mentally draining as well. Even working in shifts and having some of the team move ahead to find the easiest route seemed to do limited good with our bags heavy on our backs and the Colombian sun slowly roasting us as we moved doggedly on. The difficulty in evacuating a patient in a wilderness setting was staggering. In many ways it underlined just how isolated you are as an expedition medic, and how you are quite often the first and last line of care. It was an important lesson, and a tiring one. I’m still not sure if I can look at that bag again without feeling an urge to kick it. Finally, after hours of walking we reached our meeting point and dismantled the raft before moving on. It was at this point that we got to know Brett’s final surprise… we were to be tubing out of the jungle the rest of the way! For those who don’t know, tubing is very much in the name- you sit in a big inflatable rubber ring and paddle along the river. A boat was there to meet us, allowing us all to dump our bags before grabbing a ring and paddling on down the river. I’ve got to hand it to Brett, it was a great way to leave the Sierra Nevada, paddling along and relaxing as we got to look back on the place we’d called home this past week. Slowly the river started winding us back towards civilisation, as we passed a bridge overhead and children playing by the river. Before too long we were back where we’d started and all proud of what we’d done this past week. If I thought I had bragging rights before I left, I most definitely had them now! Being British, the first order of business was for everyone to grab a beer before piling back on to the bus, where we were met with a blast of cold air as we returned to a world with air conditioning in it! There was a definite sense of achievement to the group, having survived and thrived in the jungle over the past week. We had learnt a lot and, as Exile alumni of the Colombian rainforest we were told that a graduation ceremony was due to be held that evening! Where to hold a graduation in Colombia I hear you ask? Simple: we walked to the local pizza shack, with a view to eating our bodyweight in pizza. It turns out that the jungle is the perfect ice breaker for a group and we were having a great night when it came time for the graduation. Brett stood and went around the table, speaking a few words to describe everyone’s defining moment in the jungle as he slipped a cord around each of our necks with a wooden medallion which was inscribed ‘Exile Medics’ ‘Jungle School 2017’. Now this was a graduation to be proud of, and much better than any I’ve previously attended for myself or friends! Well, what a hectic ride. To think that in December I found out I was part of the team and frantically started preparing my kit, practicing my Spanish, asking questions left, right and centre about the jungle and booking my flights as I talked to these complete strangers on our WhatsApp group about the upcoming trip. All that was in the past and now I had lived in the rainforest, learnt medical and survival skills by the bucketful and gotten to know 20 fellow Exiles who I now shared some amazing memories with. That’s not to say any more memories weren’t yet to be made though, our group was a big mix of people and Exiles could be found scattered throughout Colombia at the beach, in the bar, at the club or halfway up a mountain in the rainforest for another month after Jungle School ended. Some of our best memories of Colombia were still yet to be made before we returned to Britain… but that’s a whole other story entirely! I thought that this section would be a good place to put together all of those thoughts that you have writing a blog like this, but never get a chance to fit into the narrative. First off, I’d like to apologise to my fellow Jungle Exiles for failing to name so many of you in this blog. As I wrote it, endless snippets and stories came to mind that put a smile on my face. Unfortunately to write them all here would have been equivalent to me writing a short novel! But now I’d like to correct my failing and say thank you to everyone who was a part of this amazing trip: Brett, Deb, Lucy, Liz, Craig, Charlie, Biz, Jena, Julia, Kristine, Lysander, Owen, Rhiannon, Verity, Kels, Tom, Patrick, Al and Ems. Colombia and the Sierra Nevada were great, but it’s you guys that made Jungle School 2017 phenomenal. That brings me on to my next point: Exile Medics really is for anyone and everyone. 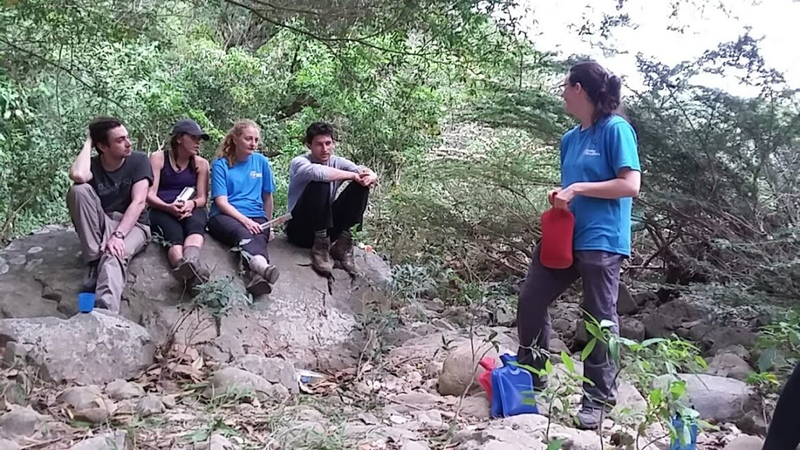 Jungle School 2017 featured 5 medical students, a paramedic, and doctors of all grades. It must have taken me at least 3 days to work out everyone’s position back home as with Exiles, there’s a freedom that you don’t have anywhere else. Hierarchy means little and everyone’s views, opinions and level of knowledge were respected and catered for. 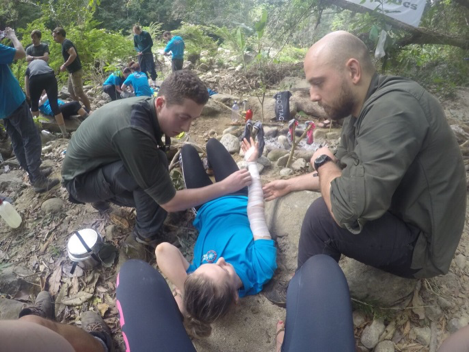 Exile Medics Jungle School 2017 was an absolute privilege to be a part of, and it’s an experience that’s going to stay with me for years to come. 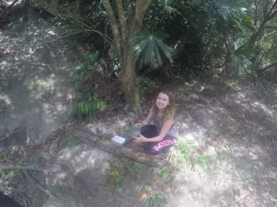 I had an amazing time in the rainforest, but that was by no means the end of the trip. I spent a further 3 weeks in Colombia, visiting numerous places including the second biggest carnival in South America and taking part in a trek to rival Machu Picchu. A lot of these experiences I shared with Exiles after Jungle School was over, a true testament to the friends you make on a trip like this! I put this Exile mantra to the test, and it passed with flying colours. But seriously, don’t take my word for it- try it out for yourself.